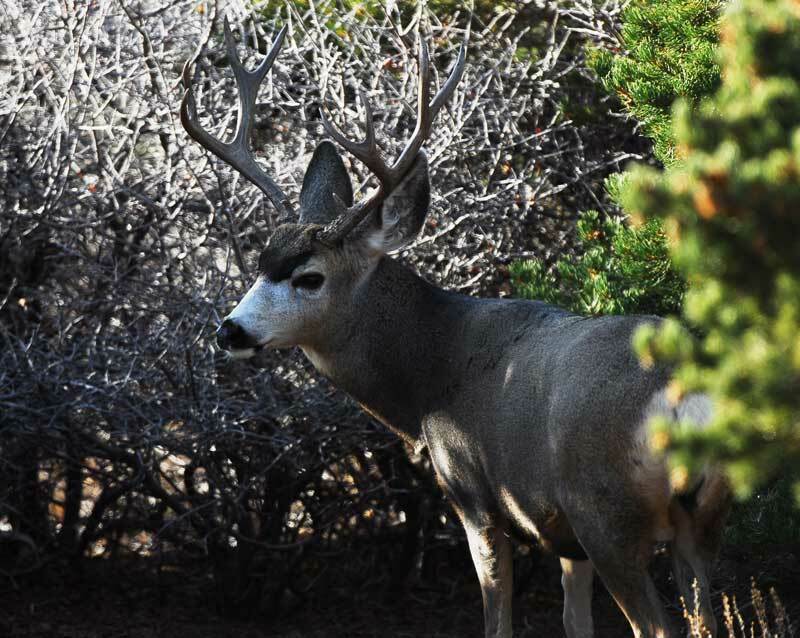 Attend a DWR open house to share your input on possible changes to mule deer objectives. Buck-to-doe ratios directly affect how many deer permits the Wildlife Board will approve. To put together our recommendations for the Wildlife Board, we will be holding open houses at different locations across the state during the month of February. What management objectives would the public support for individual units? The current objective for all general-season deer units is 18–25 bucks per 100 does (after the hunting season). One option might be to manage some units at 15–17 bucks per 100 does and others at 18–20 bucks per 100 does. We are gathering this input before putting together formal recommendations that will go out to the Regional Advisory Councils (RACs) in April. The Wildlife Board will hear the recommendations and RAC feedback in May, when it could decide to set new objectives for individual units. 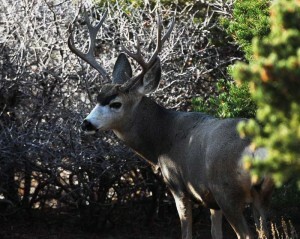 New objectives would affect how many permits the Wildlife Board approves for the 2012 deer season. In addition to discussing these topics, our biologists will be available to answer questions about the status of the local deer herds and the switch to unit-by-unit hunting. Feb. 16 – DWR office in Price (319 N. Carbonville Rd), from 6 to 8 p.m.
Feb. 21 – Grand Center in Moab (182 N. 500 W.), from 6 to 8 p.m.
Feb. 13 – Sportsman’s Warehouse in Riverdale (1137 W. Riverdale Road), from 5:30 to 7:30 p.m.
Feb. 13 – DWR office in Cedar City (1470 N. Airport Rd), from 5 to 7 p.m.
Feb. 15 – DWR field office in Washington County (451 N. SR-318 at Quail Creek Reservoir), from 5 to 7 p.m.
Feb. 22 – Sevier County Administration Building in Richfield (250 N. Main St), from 5 to 7 p.m.
Feb. 15 – The Bingham Entrepreneurship and Energy Research Center in Vernal (320 N. 2000 W., on the USU campus), from 6:30 to 8 p.m.
Feb. 23 – DWR office in Salt Lake City (1594 W. North Temple), from 6 to 8 p.m.
Feb. 28 – DWR office in Springville (1115 N. Main St., in the Conference Center), from 7 to 8:30 p.m. Please take a few minutes to stop by and share your thoughts on this important topic — we’re looking forward to talking with you! Thanks to the wildlife board and division for being a bit more comprehensive with the plan and considering all hunters. The 18-25 buck to doe ratio eliminates quite a few hunters, does nothing to address deer population growth and caters to a small segment of the hunting public, however vocal they may be. Also, what I think many don’t see, is the fact that we wouldn’t be seeing any kind of tag increase until a unit is over 25/100. That’s ridiculous and seems like another checkmark in the box of aristocratic hunting becoming the norm. Long live the North American Wildlife Conservation Model! PS, in case anyone isn’t aware, bucks don’t have fawns. Utah fish and game should be ashamed. I just looked at the list of auction / give away tags offered this year. What the hell are you guys thinking? These animals belong to us! not the state cronies!!!! If you idiots can’t get by on the funds allocated then raise the tag fees. Do not give our animals away. You guys are supposed to be fighting the poachers and crooks! You guys are acting like the crooks yourselves. Stealing game from us! Utah needs to audit all funds that should be going to the state for these bogus sales! Stop this! Not sure if you are interested or not, but for the record, I did not harvest a Buck on my 2011 Dedicated Hunter permit. As it was the 2nd year with my involvement in the program, and did not harvest a Buck in 2010, did not feel it was imperative to send back the permit/tag and thought I would keep it as a momento. I did respond to your ‘Nevada’ people’s telephone survey attesting to the fact that I did not harvest a buck in 2011. Though credited with a ‘harvest’ on my DH profile, I did not, and doubt this will affect your %’s and population figures but just FYI. Honestly, did not see anything of quality to shoot at in 2010 or 2011. And to that point, with the increased fees-especially for out-of state applicants and reduced 3-5 day hunting seasons I doubt that I will re-apply for the dedicated Hunter program in the near future. As a long time southern Utah resident I believe that excessive post-season doe hunts/depredation tags issued by the DWR during the mid 1980’s to early 1990’s, regardless of subsequent fires and harsh winters, contributed greatly to the significant reduction of Southen Utah deer herds especially on the Monroe. I am trying to figure out what your management people are doing? What kind of an organization has a draw for permits, but does not reveal how many permits are available in each region? Even the lottery has odds of drawing. This smells like insider trading with land owners, government officials, and the good ol boy system. What do you have to say for yourselves? Now I’m confused. For the last two years you stated you had a game management plan behind going to the 30 unit system. You were planning to better manage the deer herds by increasing the buck to doe ratio to above 17 or 18 bucks to 100 does in each region and manage the amount of tags issued based on numbers. Now your asking the biologist what you should be doing and they are asking the public. Stick to you game plan for a few years and see what happens. Just another half hearted decision by the UDWR. just when I thought you were making progress? Pintail 1, the DWR never said they could better manage the deer herds by raising the buck-to-doe ratios and going to smaller units. It was the state Wildlife Board that imposed that upon the DWR despite their objections. The Board’s reasoning was that doing this was a social issue to keep (trophy) hunters happy and not a decision based upon biology. The makeup of the Wildlife Board has now changed some, so the politics are swinging in a different direction that enables the DWR to manage things more along the lines of how they wanted in the first place, and they’re asking for opinions. Sounds like a positive things to me now that the old farts on the previous board are gone. I have been a hunter all my life I love to hunt but DWR please stop killing the coyotes!!! And stop asking for $ to help kill them!! I love to hunt but I also love wild places. Utah could be wild again and we could still hunt. One more thing please stop making it about money and more about conservation there are too many hunters. Kudos Richard! I was shocked and dismayed to see the check-box on the 2012 Utah Big Game application to donate for Coyote eradication. I too appreciate seeing everything wild when I hunt. Reminds me of an event advertised in the local newspaper a few years ago for a Predator/Varmint Derby Hunt–so many points assigned to each species. The hunt was cancelled due to Public (otherwise?) outcry. And one of those, at the time, ill-informed local politicians, now a Utah State Rep. has just pushed through legislation for a $50 bounty on Coyotes–ears only. Where will that money come from? You and me and unwittingly other hunters who may not want to pay for that. Nowadays, for the most part, folks in Utah aren’t guarding their flocks and herds w/30-30’s and as Hunters we, and DWR, should start to wean ourselves and our protege from the ‘kill a coyote save a deer mentality’. Definitely in agreement with Richard and David. While I do not consider myself an acconplished hunter by any means I too have noticed a significant decline in quality buck populations in southern Utah. While deer number seem on the decline I agree with the Mule deer report on your website, that predator eradication is nonsensical. I too love too see wild animals in their wildplaces. I firmly believe that predators can keep herds viable and healthy. the introduction of wolves in Yellowstone is a case inpoint,although mainly for the elk. In the case of mule deer their habitat lost has been substantial and I’m in agreement that habitat loss is a key factor in the decline of mule deer populations. Mule deer are not whitetails and require different habitat to proliferate. aside from development, fire suppression, warmer winters, the coyote eradication program is short sighted and psuedoscience in its implications. this should have never been on the application. Wild places left wild, will bring back ecosystems sustainable enough to accomadate all wild game and their interactions with predators, including the smartest predator, mankind. I think we need to go with three point or better and have a special hunt to get rid of the bad genes like 24″ 2 points. say like 100 permits for the special hunt per region and keep the regular permit number the same. I am a resident of Indiana and i’m trying to find out if my wife an I can make money from coyote bounties. Also, i’m under the impression that we will be paid for our travel expenses plus 7.50 per hour and 50 dollars per ” hide ”. Does this apply to out of state hunters and if so, is there a maximum or minimum for how much money can be paid. Scholzy, we have a page on our website that explains the details of Utah’s predator control program. It’s open to out-of-state residents, but the coyotes must be killed in Utah. We don’t pay travel expenses or any money per hour. Payment is just for coyotes turned in, which must consist of the coyote’s lower jaw and either the full pelt or the scalp (with both ears attached). Though we appreciate hearing your ideas, we aren’t the state’s rule-makers when it comes to hunting permits. In order for the right people to see your input, you need to follow the public process (contact RAC members). Here’s a web page that explains the process so you can know where to start:http://wildlife.utah.gov/hunting-in-utah/120-board-rac/public-meetings/363-rac-involvement.html. Thanks!